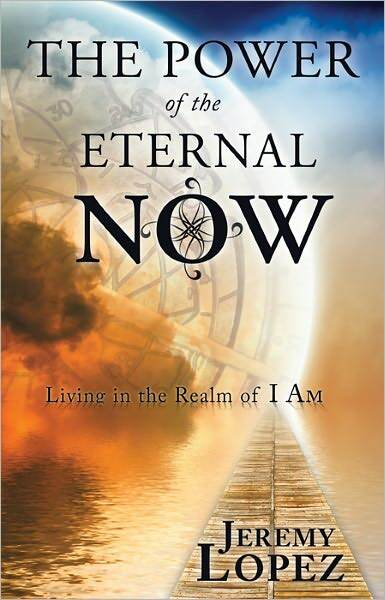 Jeremy Lopez opens a unique albeit challenging door to many in his newest book, The Power of the Eternal Now. Having already been familiar with the writer and his ministry, I knew this would not be a hum-drum religious read. Rather it is a book that certainly challenges traditional Christian thinking with concepts that some might think to be a bit New Agey. Yet it is laced with solid Scripture throughout. A core Scripture he references is Ephesians 2:6, "God raised us up with Christ and seated us with Him in the heavenly realms in Christ Jesus." Lopez challenges us to come out of our complacent mindsets regarding the past and the future and appeals to us to live fully in the present, in the Eternal now of God or the realm of I Am; just as the Father desires and has provided believers access to do through Christ. I was personally challenged by some parts of this book but found it to be an invitation to allow the Holy Spirit to take any wrong mindsets I might have out of the proverbial box. I honestly found the book to be quite refreshing and thought provoking. It really made me stop and look at certain biblical passages in a whole different light. And it made me think about where I focus my thoughts and energy most - in the past, the present or the future. Perhaps this is some of what God had in mind when He prompted me to read this book. It was also very timely for me and where I am in my life right now. And that's the central theme - living in the now of Christ. We've all been constrained in some way by the past or by waiting on something to unfold in the future. I know I have. Meanwhile, the present passes us by and after reading this book I have to wonder, What are we missing? Yes, there are times that we must wait on the Lord but equally; what do we do while we're waiting? I think that's another topic for another day. This book is nine chapters long and each chapter ends with Questions to Ponder and Spiritual Exercises to help aid the reader in becoming more aware of the present. I think that's something we can all benefit from. The thing I like about Jeremy Lopez is that he expounds on the wisdom of people from all walks of life while never compromising or substituting the truth of the Gospel of Jesus Christ. Ultimately, I believe The Power of the Eternal Now stretches our faith in a good and needed way and challenges us to live more fully in the present moment of God. After all, now is all we really have.